One option is to gear up and commute on a dedicated commuter bike, road bike or mountain bike and that’s a pretty good way to go but not everyone wants to commit to doing that every day so, in this post, I’m going to show you my favorite alternative. 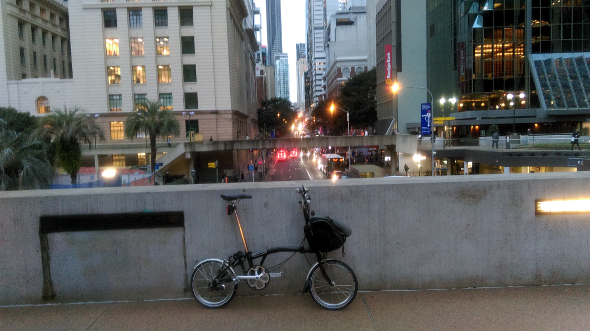 Those of you who have read a few of the posts on this website already know that I’m a big proponent of the Brompton folding bike because it allows me to toggle at will between riding and using public transport without raising an eyebrow or a sweat while allowing me to carry all the stuff that an office sausage like me might need for a day’s work. 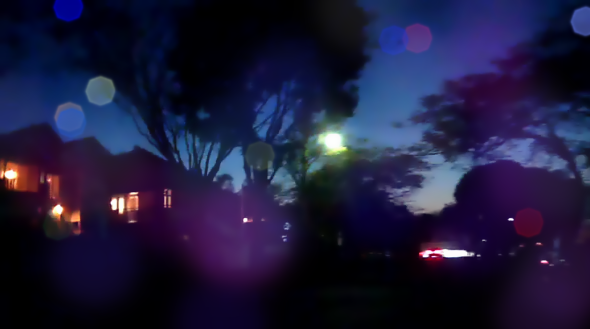 So, today I’m going to attempt to show you what a day with the Brompton actually looks like from morning to evening. The day starts with me grabbing a few essentials which usually encompass my laptop, a pre-ironed work shirt which I fold around a stiff piece of cardboard to keep it as wrinkle free as possible and slide into a flat compartment in my Brompton C bag. I ride in the trousers and shoes that I’m going to wear for the day. It’s a good idea to freshen up when I arrive at work and, although one of the main advantages of bimodal commuting is that you can usually avoid the need to shower at your destination because of the relatively short distances you ride in the mornings, I still like to carry a couple of pre-moistened face washers each day and have a quick sponge bath before putting on my clean shirt and deodorant. Besides the shirt and face washers, there isn’t a great deal more to prepare day to day but my C bag does also permanently contain a rain jacket, rain pants, a bike lock, deodorant, a few basic tools, a spare tube and one of those drawstring backpacks I have mentioned previously. The C bag also comes with a very handy rain cover. Altogether, that’s about five to ten minutes of prep before I can fire up the Fly6 and be out the door. 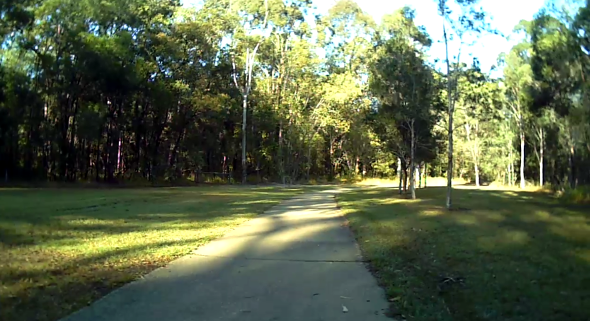 I’m lucky enough to be able to ride mostly on bikeways from my house to the train station so my morning starts in park surroundings with birds, flowing creeks and other good stuff with the din of the morning traffic only being apparent on a few short stretches of road and crossings. Before long, I’m at the train station where I can ride right up to the entrance and fold the Brompton or duck into the cafe next door for a quick coffee before the train arrives. At this point, the more skeptical of you might be asking why I wouldn’t just drive to the train station and park. The answer is: because over such a short distance in peak hour, riding is faster once you take all the stops and starts into account and also because leaving your expensive, devaluing asset baking in the Queensland sun or being thrashed about in a storm every day will devalue it all the more quickly. There’s also the issue of reducing your carbon footprint and contribution to traffic congestion but I won’t harp on about that right now. Even on a very full train, the Brompton takes up little more room than a small suitcase and if there’s standing room only, straddling the folded Brompton with the C bag resting on top, you’re still be taking up about the same amount of room as anyone else not carrying a Brompton. 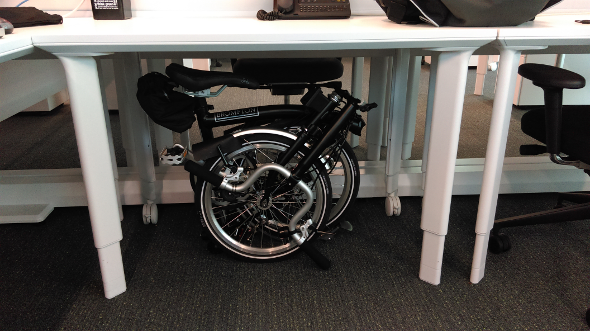 And if you’re seated, the Brompton will happily stand on it’s own next to you though, to help stabilise mine a little more, I’ve added a rubber stopper to the end of the left grip which has lengthened it slightly and thus provides an extra contact point on which it can rest. With that addition, the Brompton survives even the worst jolts the train driver can dish out. 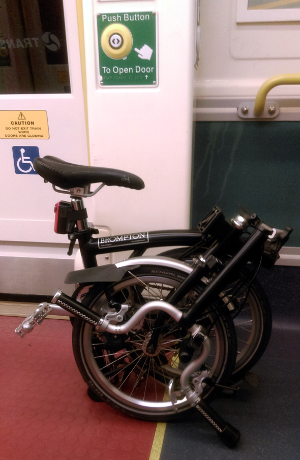 Arriving at Central, I can unfold the Brompton while I’m still on board if the carriage is relatively empty. Otherwise I can have it unfolded on the platform with the bag attached before the train starts pulling away from the station. From there it’s a one handed operation for me to carry the whole thing up the stairs or on the escalator and the handlebars are narrow enough to fit through the regular turnstiles without needing to use the wider wheelchair turnstile though they are more comfortable to get through. Once I’m out of the station, it’s Fly6 on, Bluetooth headset in (of course, pulling over if I need to take a call which is easy and quick because I’m on a bike) and I’m free to shoot across town in any required direction. Having arrived at my destination, it’s just a matter of folding and rocking straight up to the elevator to complete the journey. 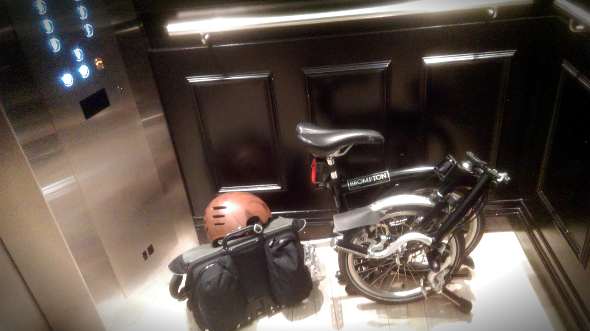 From there, the Brompton settles in for a day of rest under a desk, in a cupboard or in a corner while I grab my pre-moistened face cloths, deodorant and clean shirt and head to the bathroom for a quick change. Once that’s done, as long as you remember to roll down your drive side pant cuff, nobody so much as suspects anything about your mode of arrival. Fetching lunch later on might be a walk-to affair but, then again, you might have that very urgent appointment, package collection or job interview that is clear over the other side of the Brisbane CBD in which case there’s nothing better than grabbing the Brompton and stretching your legs after the morning’s Internet surfing and pretending to work. Thankfully all work days eventually come to an end at which time the next opportunity to unfurl the Brommy eagerly presents itself. 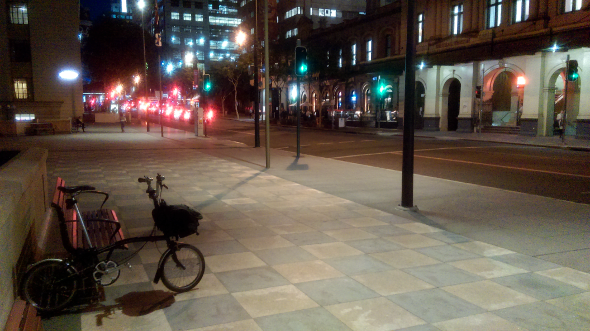 I can trundle back up Edward St to Central station but then there are those nights when spending time on a train while there’s a perfectly good bike to ride seems like a waste. 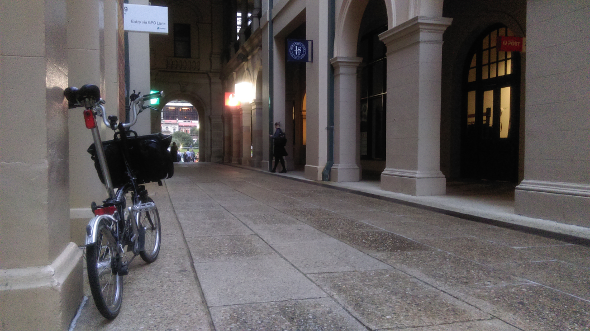 And so, it’s time to find a bikeway – maybe it’s the Bicentennial and over the Goodwill Bridge if you’re heading south or maybe it’s off through the Roma Street Parklands and on to the Victoria Park Bikeway if you’re heading north. Now that the day is done, getting a little sweaty (or a lot) doesn’t much matter because you’re heading home and, because riding at night is the closest most of us will come to flying through outer space, you may feel inclined to go hard and really feel the wind in your face as the little Sturmy Archer hub ticks and whirs behind you. On an early, clear spring evening, the glow of the last light dyes the crisp sky a deep blue that fades to black and, in combination with the stars and the lights from the passing houses, it all looks like moving scene from a children’s story as I heave up hills and glide along flats with the cool air rushing past me like an exotic refreshment. Of course, on a night like that, you may be inclined to avoid going home straight away and instead just keep the high going a little longer. Maybe you’ll find a long way home, stop off and grab some dinner or pick up those grocery items you forgot on the weekend grocery run – there’s still room in the C bag so no need to hesitate. There you have it – a new twist on bike commuting, a new way to see your city and hopefully something to make commuting a high point in your day. And if I’ve whetted your appetite for a Brompton successfully, you can see, touch and maybe even ride one of the beasties at Epic Cycles, Paddington (no, they didn’t pay me to say that). Keep riding and see you out there some time.